1 Microwave cheese, Hellmann's® or Best Foods® Real Mayonnaise and sour cream in microwave-safe bowl at HIGH 20 seconds; stir until smooth. Stir in turkey and tomato. 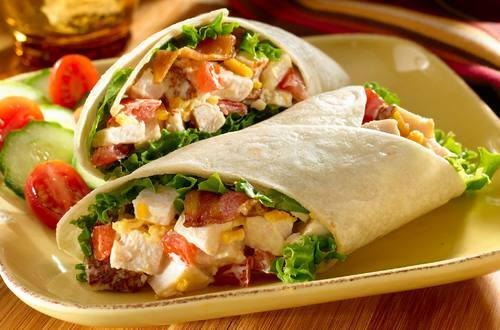 2 Arrange lettuce on centers of each tortilla, then top with turkey mixture and bacon. 3 Roll up and secure with toothpicks. Slice in half diagonally and serve.